What Is DA Form 759? DA Form 759, Individual Flight Record and Flight Crew Certificate - Army (Flight Hours) is a form used to close out flight records and is required for all soldiers on flight status. The form is generated by Centralized Aviation Flight Records System (CAFRS) for each soldier on flying status when closing their records. The latest version of the form - sometimes incorrectly referred to as the DD Form 759 - was released by the Department of the Army (DA) in July 2018 with all previous editions being obsolete. An up-to-date DA Form 759 fillable version is available for digital filing and download below or can be found through the Army Publishing Directorate website. The DA Form 759 has to be digitally signed by the soldier's aircrew training program (ATP) commander in CAFRS in order to be valid. The form is signed and dated by a certifying officer if the ATP commander is not the one who authorized flight duties on the DA Form 7120 (Commander's Task List). How To Fill Out Da Form 759? For use of this form, TC 3-04.11; the proponent agency is TRADOC. For use of this form, TC 3-04.11; the proponent agency is USAACE. Part I - Biography/Demographic - contains 12 boxes in total. The information required in Blocks 1 through 4 is copied from the current DA 759-1. Blocks 5 through 12 require personal identifying information about the soldier. This includes their date of birth, aviation service entry date, service branch, unit, component, military occupational speciality - or MOS - and their assigned duty position. Part II - Flight Hours - contains two sections. Section A - Qualifications - is a table with 14 columns. These columns require listing the names of aircraft systems, qualification dates, the dates of last flights, the total amount of flight hours and a number of aviation test results. Section B is for calculating total hours flown under different conditions. Block A is for Combat. Block B is for Imminent Danger. Block C is for Civilian RW (Rotary Wing). Block D is for Military RW. Block E is for Civilian FW (Fixed-wing). Block F is for Military FW. Block G is for Historical Hours. The total amount of hours is calculated and recorded in Block H.
Part III - ATP - is for providing aircrew training program results. The ATP section requires the results of a series of different evaluations including the Maintenance Test Flight Evaluator (MTFE), FAC and others. Part IV - Remarks - can be used to provide any additional information. DA Form 759-1, Individual Flight Record and Flight Certificate-Army (Aircraft Closeout) is a form used to record soldier's flight time by flying duty and condition for each aircraft or flight simulator during the closeout period. DA Form 759-2, Individual Flight Records and Flight Certificate-Army (Flying Hours Work Sheet) serves as a record of an aviator's flight hours. It can be used as both a temporary and consolidation worksheet. 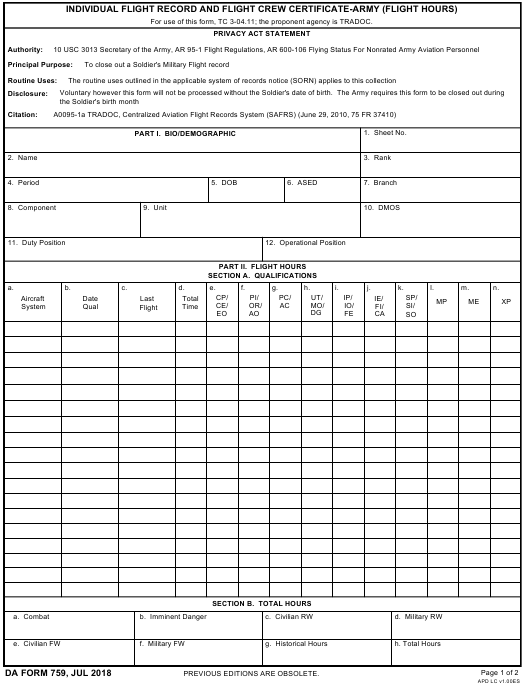 DA Form 759-3, Individual Flight Records and Flight Certificate-Army (Flight Pay Work Sheet) is a form used to keep soldier's flight records in order to set flight pay. DA Form 2408-12, Army Aviators Flight Records is a form located in an aircraft logbook and completed after each flight. 5. DA Form 3513, Individual Flight Records Folder, United States Army is the folder in which all flight record forms are arranged at closeout.